Centric Bank and AHA launched The Red Couch Series to increase awareness of heart disease in women. Women are encouraged to sit on the couch and offer testimonials about why they’re inspired to live a healthy life, as well as share personal stories about how heart disease and stroke has touched their life. It’s American Heart Month, and Centric Bank and the American Heart Association (AHA) Central PA invite the community to sit on the Red Couch and “Share Your Why.” The two organizations launched The Red Couch Series as a powerful storytelling campaign to increase awareness and prevention of heart disease in women. The signature Centric Red Couch is traveling to locations throughout central Pennsylvania. Women are sharing testimonials about why they’re inspired to live healthy lives, how heart disease and stroke have touched them, and ways they are putting their heart health first. These stories are collected and shared on social media using the hashtag #CentricRedCouch. Husic started the Red Couch campaign to encourage women to have a conversation with their doctors and each other about signs and symptoms of heart disease. Heart disease and stroke kill approximately 1 woman every 80 seconds. “That’s a grim statistic we hope to change by raising awareness about the warning signs of heart attack and stroke," says Husic. 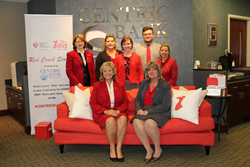 The Centric Red Couch began its journey in December 2016 at the Centric Bank Financial Center on Linglestown Road in Dauphin County. It then traveled to Rhoads & Sinon Law Firm in Harrisburg for the kick-off of the New Year. Throughout February, the #CentricRedCouch will be located at the Derry Township Centric Bank Financial Center in Hershey, Pa.
To bring the Red Couch to your organization, or for more information about the 2017 Capital Region Go Red for Women Luncheon, visit capitalregionpagored.heart.org, or call 717-730-1782. A three-time Best Places to Work and Top 50 Fastest-Growing Companies for four years, Centric Bank is headquartered in south central Pennsylvania with assets of $482 million and remains the leader in organic loan growth in central Pennsylvania. A locally owned, locally loaned community bank, Centric Bank provides highly competitive and pro-growth financial services to businesses, professionals, individuals, families, and the health care and agricultural industries. With a Five-Star Bauer Financial Rating, Centric Bank, named a Top 100 SBA Lender in the United States, also ranked #1 in approved SBA 7(a) loans in the Eastern District as of December 31, 2016. The bank is also a Top 20 Lender for SBA Loans in the Philadelphia Region. The year 2016 was a milestone for Patti Husic and Centric Bank. In October, Centric Bank was named a Top Team in American Banker’s 25 Most Powerful Women in Banking, an exclamation point to Husic’s intentional advancement of high-achieving women. Husic herself ascended to #17 in the Most Powerful Women in Banking, a recognition that has brought national attention to the bank’s organic lending successes and Husic’s commitment to ‘Be the Difference Maker’ for the men and women on Main Street. Founded in 2007, Pennsylvania-based Centric Bank has financial centers located in Harrisburg, Hershey, Mechanicsburg, and Camp Hill, and loan production offices in Lancaster and suburban Philadelphia. To learn more about Centric Bank, call 717.657.7727 or visit CentricBank.com. Connect with them on Twitter at @CentricBank and Facebook at Centric Bank.